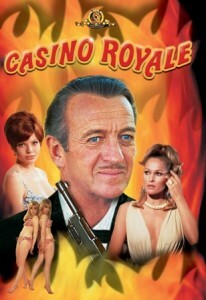 Casino Royale is a spoof James Bond film which is loosely based on Ian Fleming’s first novel of the same name. The plot film centres on James Bond coming out of retirement to take on the forces of SMERSH. The film has an ensemble cast including David Niven as Sir James Bond, Peter Sellers, Ursula Andress, Osron Welles and Woody Allen. Mereworth Castle was used as Sir James Bond’s home, which SMERSH blow up at the start of the film. Mereworth Castle is not actually a castle but a grade 1 Palladian country house in the borough of Tonbridge and Malling. It is now privately owned and not open to the public. Casino Royale is available to buy on DVD. This entry was posted in Filmed in Kent and tagged Casino Royale film locations, David Niven, Mereworth Castle. Bookmark the permalink.